How Does My Vehicle’s Cooling System Work? A vehicle’s engine produces a lot of heat while running. 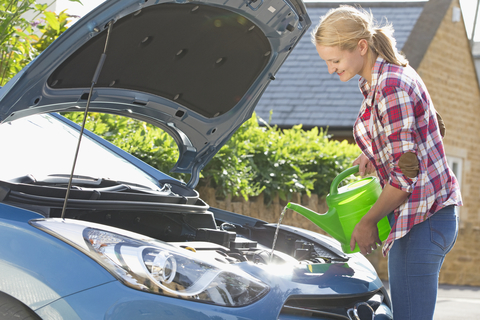 In order to avoid damage, your engine must be cooled continuously. Enter your vehicle’s cooling system, whose job is to cool and maintain your engine’s temperature. There are two types of cooling systems, liquid and air. You don’t find too many air cooled vehicles anymore, so we’ll focus on liquid for this article. Read on to learn what makes up your car’s cooling system and how it maintains your engine’s temperature! The following is a list of some of the main players in your vehicle’s cooling system. Your vehicle’s cooling system works by sending coolant through passages in the engine block and heads. The coolant is pumped through the system by a water pump. As the coolant flows through the passages, it picks up heat. The heated coolant then enters the radiator. The radiator cools the liquid by the use of a fan. Once cooled, the coolant is returned to the engine to absorb more heat. It’s important that your engine’s temperature doesn’t fluctuate too much. If the temperature is too low, fuel economy decreases and emissions rise. If the temperature is too hot, the engine can suffer major damage. In order to keep a car’s engine at a steady temperature, a thermostat is placed between the engine and the radiator. If the coolant gets too cold, the thermostat blocks the coolant flow to the radiator, forcing the coolant to go directly back to the engine to collect more heat. In order to keep the coolant from overheating, the cooling system is pressurized to increase the boiling point of the coolant. However, too much pressure in the system can cause severe damage, so the radiator cap’s job is to relieve pressure if it exceeds a certain point. Is Your Cooling System In Need of Repair? Contact or visit Park Muffler for all your automotive repair needs! We have over 30 years of experience, and are conveniently located on the edge of Sherwood Park.